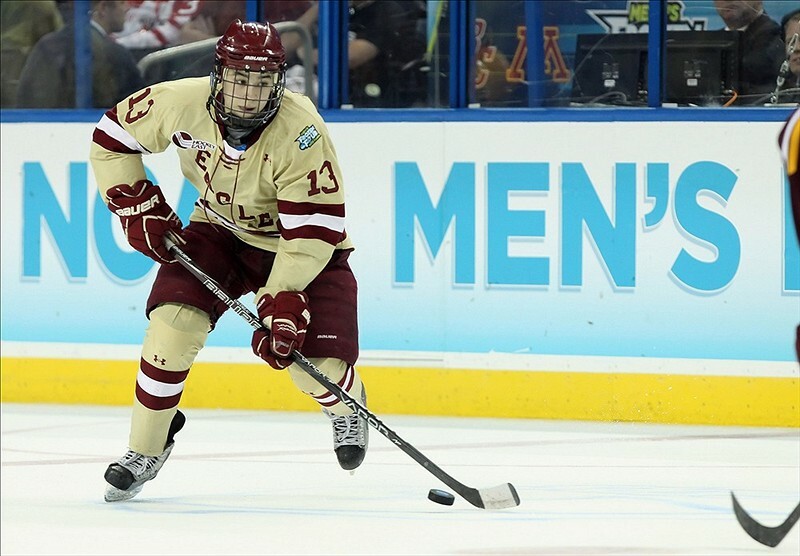 Johnny Gaudreau began the 2014-15 NHL season with a lot of hype and fanfare. The winger – generously listed by the NHL as 5’9″ and 160 pounds – has become a big fan favourite in Calgary because of his explosive speed and amazing hands, and did nothing to quell the hype when he scored a goal in NHL debut on April 13 against the Vancouver Canucks to end last season. He made the team out of training camp and even traded in his training camp number of 53 for his old college number 13 – previously held by another small speedy forward, Mike Cammalleri. Hopes were high for Gaudreau to explode out of the starting gate and make a push for the Calder Trophy on the season’s out-set. He proceeded to go pointless in the team’s first five games, four of which were on the road. For the team’s sixth game in Columbus, Gaudreau was a healthy scratch. The reasoning provided by the coaching staff was for Gaudreau simply to watch from above and change his perspective. Hockey is an incredibly fast sport, to the point where when you sit close to the action – or your only exposure to game speeds is on the ice or from the bench – you can get a bit caught up in everything. On the contrary, sitting in the upper levels of the arena often lends a new perspective; instead of focusing on one section of the ice, you can get a bigger picture of how plays develop and where you can adapt. Amateur scouts almost exclusively sit up in the corners of arenas for this reason; you can get a broader picture of the game as it develops. Gaudreau notes that his game watching from above definitely altered his perspective a bit. “Looking up-top, I can tell you have a little more time and space in areas where I really didn’t expect since I was playing on the ice and the guys are so much faster here, I really didn’t expect to have as much time as I did in some of those areas. It was really beneficial,” he said. Just 21 years old – and a young 21 at that – Gaudreau is the second-youngest Calgary Flames player besides Sean Monahan. As such, given he’s still in the single digits in NHL appearances, he’s very much a work in progress as a pro. The youngster is approaching every day as a chance to improve and evolve his game. Gaudreau definitely made an impact on his return to the Flames line-up; he had the game-winning goal and an assist in the team’s 4-1 win over Winnipeg to close out the team’s six-game road trip, as well as a gorgeous set-up on Dennis Wideman’s goal in Calgary’s 2-1 overtime loss to Tampa Bay two nights later. On-lookers in the press box were convinced that Gaudreau’s dish was a no-look pass, but he dispelled that myth – noting he had indeed seen Wideman on the play. Nobody expects Gaudreau to make passes like that – or score goals such as the wrap-around marker in Winnipeg – every single game. But if he can continually improve his all-around game over the course of his first pro season, he’ll likely be under strong consideration for the Calder Trophy when the Professional Hockey Writers Association votes on awards at the end of the regular season. You don’t win the Calder in the first month of the season, after all. It’s your season-long body of work that ultimately matters most.